With increasing concern about rising rates of obesity, public health researchers have begun to examine the availability of parks and other spaces for physical activity, particularly in cities, to assess whether access to parks reduces the risk of obesity. 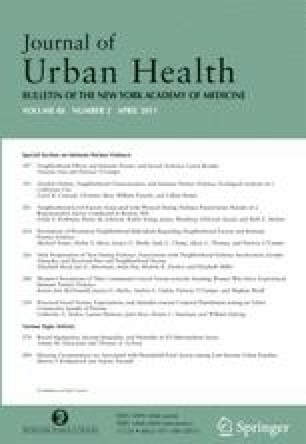 Much of the research in this field has shown that proximity to parks may support increased physical activity in urban environments; however, as yet, there has been limited consideration of environmental impediments or disamenities that might influence individuals’ perceptions or usage of public recreation opportunities. Prior research suggests that neighborhood disamenities, for instance crime, pedestrian safety, and noxious land uses, might dissuade people from using parks or recreational facilities and vary by neighborhood composition. Motivated by such research, this study estimates the relationship between neighborhood compositional characteristics and measures of park facilities, controlling for variation in neighborhood disamenities, using geographic information systems (GIS) data for New York City parks and employing both kernel density estimation and distance measures. The central finding is that attention to neighborhood disamenities can appreciably alter the relationship between neighborhood composition and spatial access to parks. Policy efforts to enhance the recreational opportunities in urban areas should expand beyond a focus on availability to consider also the hazards and disincentives that may influence park usage. Support for this research was provided by a Partnerships for Environmental Public Health administrative supplement to NIEHS grant R01ES014229. “Obesity, Physical Activity and Built Space in New York City” (PI: Andrew Rundle). The authors additionally would like to thank the National Heart Lung and Blood Institute (Grant # HL068236), the National Institute of Environmental Health Sciences (Grant # P30 ES009089), and the Robert Wood Johnson Health and Society Scholars program for their financial support. In the PIP data provided by the New York City Parks Department, there are 4,815 park properties with information. Park properties can be standalone parks, park zones (which is a specific PIP designation), playgrounds, or other park areas. However, many of the park properties coded in the PIP data file are ones we would expect to have minimum effect on physical activity. Specifically, parks with one of the designations listed below were excluded from our analysis, resulting in a total number of park properties of 1,795. Four additional, unclassified park types were also excluded. Bloch M, Carter S, Evans T, et al. Murder: New York City. New York Times. June 18, 2009. http://projects.nytimes.com/crime/homicides/map/. Accessed 3 May 2010.